Fall 2018 practices begin the week of September 16th. Team managers and coaches may make changes to the practice schedule. You should follow their direction and communication. IMPORTANT NOTICE - Oak Marr is NOT available on Sunday, October 7th. We will not practice at Oak Marr on that date. Individual teams will determine if they will practice on those dates based on alternative field space. At this point NO practices are scheduled for these dates. 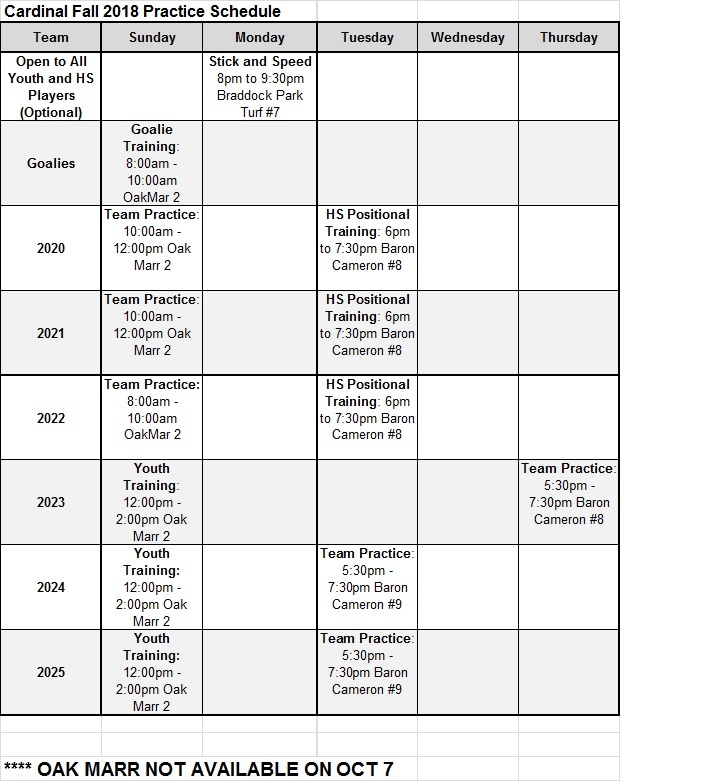 High school teams (2020, 2021 and 2022) will have one team practice per week on Sunday at Oak Marr. Youth teams will have one team practice per week at Baron Cameron Park. Alternative team practices may also occur based on coaching availability. Youth teams (2023, 2024, 2025) will participate in a youth skills training session on Sundays at Oak Marr. All three teams will train together and focus on skills, fundamentals, offensive, defense and transition. This is a required practice session. Janaye Dzikewich and Katie Oliverio will lead stick and speed training. Both coach Cardinal 2020 and are former University of Louisville lacrosse standouts. This program is open to all age groups and will combine speed training, injury prevention and stick skills. The session will be broken into half stick and half speed work. Age groups will be separated appropriately. Dates: Mondays - 1st session is September 17 - Last session is Monday, October 29.